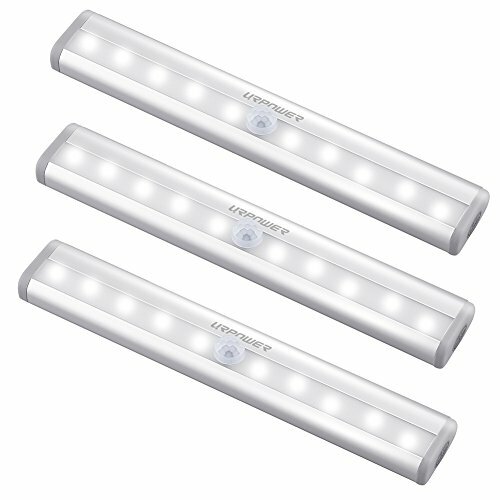 URPOWER 10 LED Motion Sensing Closet Lights, using the passive infrared technology, auto turn on as soon as you are within 10 feet and stay on as long as you are moving. Once you are still for a few seconds, or walk out of range, they turn off immediately. These lights can provide an excellent lighting at an advantage of being fixed as well as portable if need be. Best battery motion light for your kitchen cabinets, stairs, hallway, bathroom and so on. 1. Please make sure if the batteries have been installed in the correct direction. 2. Please use safe and reliable batteries to prolong the lifetime of your lights. Motion & Night sensor: With passive infrared technology, it can be detected by the motion of human in the dark. Auto-on within 10 feet, auto-off after 12-15 seconds of no motion detected. Excellent lighting: With 10 LED in each light, which can light up with a good amount of light. Not like a reading lamp but enough to see around your entire room with no difficulty. Battery operated: Saving time on pulling and charging, 4PCS AAA Batteries required (Not included), which will available for long working time. Easy to install: With magnetic strip, No tools, screws or nuts needed. Stick-on anywhere. Perfect for stairs, pantry, closet in the bathroom, basement entryway etc. Warm prompt: 1. The light won't turn on if the light sensor has been detected by the enough light. 2. Never install the light near the place where is damp or with high temperature to ensure the sticky tape work well.